Anyone built there own skiff? My boys and I are thinking to build a skiff this summer, anyone on here done that? We initially were going to build a conchfish off of plans from Chris Morejohn, he designed and built the hells bay whip ray, which I've always wanted. Lately however we've been thinking the 18 Laguna Madre from bateau.com because it will be easier for our first build. Interested to hear thoughts and experiences, we have a couple more projects to finish before we get serious but intend to build it in the garage at our bayhouse in Rockport. I have a friend that did and your garage will be a mess and have materials blown everywhere. Seems like a member did a build along in the diy section, if you havent already found it. I've not built a skiff, but I have built a drift boat, stitch and glue style, with fiberglass over marine grade plywood. I currently have a second one underway in my own garage. The Bateau boats look really solid. I will say this, take all the warnings about epoxy sensitivity/fiberglass dust seriously, and expect it to take a year to finish the boat. It might take longer than that, but don't underestimate the effort! Home Depot carries respirators from 3M, and you can get some very good filters for chemical work, and for sanding/grinding fiberglass. Those are an absolute must. I just saw that they carry kits for some of the boats with plywood already cut to shape. That would save you a lot of time, and I'd highly recommend buying a full kit. Don't be dumb like me, with a two year boat project on your hands! Thanks for the info, I am definitely thinking to buy the whole kit. I have done it and built another for a friend. Search my user name on the bateau forum to find my build thread. I took the GF-16 plans and modified them a good bit, even added a tunnel against Jacques's recommendations. It does everything I need it to and I even used it in the streets of Port Arthur as Harvey was passing through. I would not recommend buying the precut plywood kit as the measuring and cutting are good things you should work on with your kids. Definitely buy the epoxy and fiberglass kit from them though, and buy a couple of extra gallons of epoxy and the quick fair. Doing it over the summer would be difficult but it depends on how much your kids could get done while you are at work during the day and what level of finish you desire. 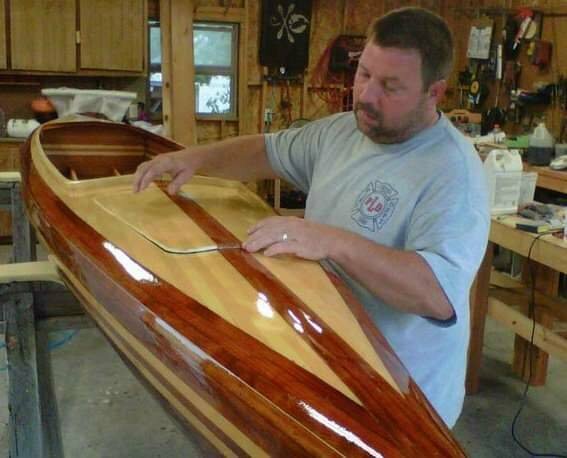 Building the boat is not that hard, but making it look good takes time. Thanks for all the info Tim, I'll check out your build today. My boys are 18,22, and 24 and pretty handy, their skill level is much higher than mine, especially with fiberglass. We'll probably buy the pre-cut kit just to save some time on this first build. Where in Houston sells marine plywood? I ordered mine online from Ohio. My uncle built two back in the old days. Like minny versions of barges going up and down the Arroyo Colorado. Flat bottom out of plywood. He used them to fish and run ribbon lines in the flats. Since there wasn't much room he used ice chests to sit on, remember everyone making fun of that. If he broke down he had to push it to the intercoastal to get a tow. There weren't any other boats around to get into the flats. When we would fish the shallows, he would sit on the bow and walk the boat around. Dargel later came out with a two man skiff alot like the ones he made. I'm planning to one of these winters, but haven't yet. When y'all do, start us a follow along thread. My brother did an XF 20 with a tunnel and put a merc 115 on it. Said it was a cool labor intensive project, but he would never do another. He has a huge shop he built it in. Cool story and great memories I bet! Did he glass the plywood or just paint it? My neighbor built a little 10’ skiff. Tunnel hull and a little center console. Looks like the little Mowdy S10. He built it out of wood, glasses and painted it. I'm thinking very basic, portable gas tank etc with a tiller, nothing fancy. Will do, you fish the east cape that hunts tarpon at poc jetty? Last edited by pilar; 04-14-2019 at 08:23 PM. Cool. Was it a kit? Cool place to shop for those that fancy themselves a woodworker. Buying from www.bateau.com is a good option too but the shipping is brutal if you have a place like Houston Hardwoods close enough to make the trip. We have a place here in Nederland, Wes Vice Hardwoods, that I have ordered some good products through too but HH stocks lots of items. Yeah, I was thinking that your boys were quite a bit younger. If you have the extra budget you cannot go wrong with the CNC precut kits for their boats. Great service from those guys and a truly interactive forum. If you start a build thread there many will follow and help y'all out with advice and encouragement if you get stuck on something. The designer, Jacques, will even answer questions and provide help. Thanks, we'll have proper safety gear and ventilation when it comes time to deal with the toxic stuff. Compared to the Hell's Bay I want the kit is a steal . I looked at your build, wow! Amazing boat, cool the tunnel worked out with all the "experts" doubting you. Not sure. I can find out. I do not, unfortunately my little boat isn't a big fan of big water and I spend so much time overseas and up north it hardly leaves the back lakes and side channels. A few years back I was working for fedex. I had to take a cargo plane back to the states, long story short we crashed. I woke up alone on an island. I was there for a quite a while, I knew I wouldnt last much longer so I had to try and escape. So I made some rope, tied some logs together and made a skiff. Wilson and I set off the next day. We were at sea for weeks and finally a big freight ship me up and brought me home. Thats when I made my skiff. Gotcha, somebody has an ec there that I saw catch two tarpon on the fly about 3 years ago, it was impressive. Thanks. I paid $300 to have 11 sheets shipped from Ohio to Tyler. That's almost worth it to not have to haul 700 lbs of plywood 200 miles in a Nissan Frontier. I built a 12’ skiff/duck boat 10 years ago and still run it every year. Probably have 120 outings easy in it. I didn’t not use Marine grade plywood. I have zero soft spots or delamination. My ply wood was very dry though. Sat in my exterior barn/garage for about a year. My only complaint is weight, I over did it. Thinking about doing a build using either divinycell or klegecell, problem I have is just time. Good info. I'd like to build out of divinycell for this first one but I'm afraid it would end up taking so long that I'll lose the interest of my crew. I’ve made deer blinds out of divinycell, I’ve you where real technical you could vacuum bag it and cut down your build time to half. This is where I buy all of my epoxy resins. Affordable and very high quality. Stay away from polyester resins. This is one of the kayaks I've built with their fiberglass and resins. Last edited by DarrellS; 04-16-2019 at 08:00 AM. I helped a buddy of mine when he started ultralightboatworks and we fished a couple tournaments out of that little boat. It was a pretty labor intensive operation and messy as hell but the first finished product wasn’t terrible and would run in spit. He now owns Sabine Skiffs in La Porte. Ha ha I know Brian too. I had to bring him some gas out in Sabine Lake one evening when he did not plan well. One of my box fans is still tinted red from him using it to ventilate a make shift paint booth as he was repainting his skiff in his garage. He still owes me for that gas. Thanks for the info, that kayak looks incredible! Cool, I've talked to him a couple times on the phone, if I decide to buy a skiff instead of building, good possibility it will be one his. wow. looks like one can get really deep into a build, for sure, good luck!